It comes in a gift box ready for gifting. 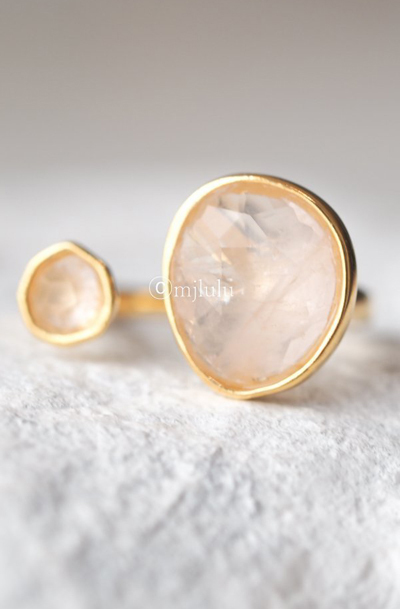 >>>>gold plated brass metal >>>>adjustable us ring size 6~8>>>>simulated rose quartz used >>>>rose quartz is the stone of unconditional love that opens your heart to all types of love—love for yourself, love for your partner, children, family, friends, community, the love of everything on Earth. wearing rose quartz stone jewelry surrounds you in a bubble of love energy and filling your body with positive energy. >>>> due to the nature of stones, each one may vary slightly in color, shape, size. stone has irregular cracks or marks on the surface. these are not imperfections but nearly beauty marks. every piece is beautiful and one of a kind.